Mixed Martial Arts or MMA is for now a popular sporting event, and Warrior is capitalizing on this niche to tell a rather simple story: two brothers having to fight, literally and metaphorically against each other and the ghosts of the past. While Warrior does not reach the level of Rocky or The Fighter, it has a lot of heart and passion in its telling that make up for its flaws. 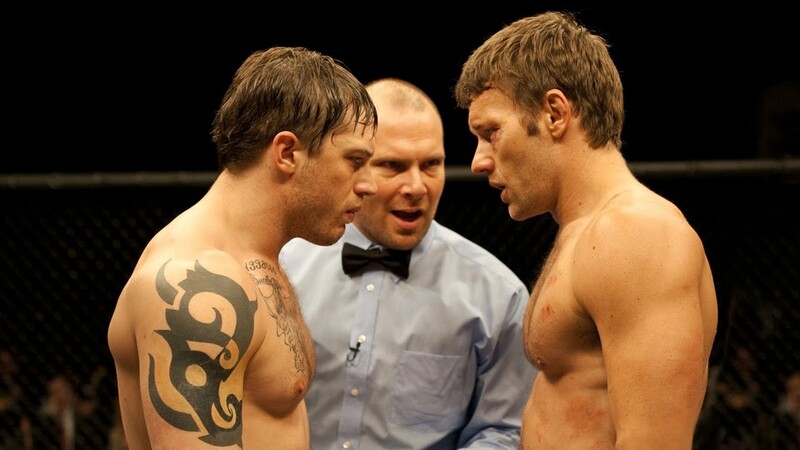 Tommy Reardon (Tom Hardy) has come back from serving in the Marines. Directionless, he finds himself at the home of his father Paddy Conlon (Nick Nolte). Paddy has turned his life around: he's been sober for twenty-some years and has found/rediscovered his Catholic faith. Tommy is not one to forgive how abusive his dad was when he was a lush, or how he and his mom had to leave, or how his mom died shorty afterward. In short, Tommy doesn't think much of Daddy. However, Dad was a good trainer, and the former wrestling star is now inspired to go into the Sparta Tournament, a battle royale of MMA, especially after having taken down a fierce fighter virtually with no experience. The purse will come in handy to help the widow of a friend from the war for reasons made clear later. Tommy asks Daddy Paddy to train him even though he still hates his dad. Not that Tommy's older brother Brendan (Joel Edgerton) thinks much of Dad either. While Tommy's world is all darkness and despair, Brendan's is remarkably bright and sunny. A chemistry teacher, he has his loving wife Tess (Jennifer Morrison) and two daughters. However, he is having problems of his own: the mortgage crisis has affected his home, and he needs a quick way of raising the money to keep their home. Luckily for him, he knows a bit of mixed martial arts, and can earn some money fighting on the side. The visible injuries Brendan has after a fight attract the attention of school administrators, who promptly suspend him, but this is a positive: it gives him a chance to get into the Sparta Tournament. He trains, and the Conlons are on a collision course. Eventually, they make it to Atlantic City, where they fight, and they fight, culminating in a battle between them for the championship. This after family secrets are revealed, and Tommy's real identity (he had been using his mother's maiden name throughout) and his actions in Iraq (both good and bad) are exposed. Warrior certainly has heart: Cliff Dorman, Anthony Tambakis, and director Gavin O'Connor create a story that is not just about mixed martial arts but also about a most dysfunctional family. O'Connor to his credit shows the difference between Tommy and Brendan with Masanobu Takayanagi's cinematography: often Tommy's world is shown with dark hues and gritty surroundings, while Brendan tends to be seen with bright sunlight around him. It suggests the worlds they live in: Brendan's more positive life with wife, job, and children as opposed to Tommy's dark world. Out of the three main performances, Nolte was the one that carried the most weight. He created a character who has made peace with his own demons but has not made peace with his own sons, who detest him and want nothing to do with him. In his first scene Nolte underplayed the hurt his son is inflicting on him by rebuking his past actions and mocking his sobriety and return to faith. He does the same when trying to speak to Brendan, which makes Paddy's eventual but not surprising fall off the wagon even sadder. Hardy is all angry and growling with perhaps one exception: when he speaks to the widow of his best friend from Iraq. I digress to point out that his buddy's widow, a Hispanic woman from El Paso (my hometown) is portrayed in a stereotypical way: in a run-down home who answers the phone and speaks primarily in Spanish. Sorry, boys: my house is not a mansion, but it is structurally sound, and I answer my phones in English. However, judging from the looks of the house, she appears to live in the Northeast. This subplot about Tommy's actions in Iraq are efforts to give him motivation to enter the contest and discovered by a remarkable series of coincidences that do appear to be a little hard to believe. However, you have to go with it to make Warrior work. Edgerton's Brendan communicates a truly loving husband and father, making him a sympathetic character whom we can root for. Since we care about his situation, we can get emotionally involved in seeing him succeed. A man who fights for his family is a hero. One clever idea in Warrior involves the cliche of the training montage. Since we have two people training for the same event, we have to have split screens between Tommy and Brendan, but thanks to the editing we have the brothers in boxes floating around while one image gives way to another. The cleverness here is that both Conlon brothers are not short shifted in screen time. This isn't to say Warrior doesn't have some flaws. Tommy's behavior, especially at the Sparta Tournament, is so unpleasant that he becomes extremely unsympathetic. While his actions in Iraq may be a motivating factor in his anti-social behavior, he really is the same surly individual throughout the film. There is also an effort to build up the battles the brothers have with the other opponents even though we already know they will meet up at the climatic battle. It also is a bit hard to believe that Brendan's students would not be able to watch the Sparta Tournament together, especially since it was broadcast on ESPN, or that the whole school would be rallying to his side. On the whole, Warrior knows what it is trying for: an inspiration story about two brothers fighting for more than the cash reward. One fights for his family, one fights to ease his conscience, and even Paddy fights for something: the love of his sons he has done wrong. To their credit the fight scenes are intense and on the whole well-filmed, though they can't resist the fast-moving camera people are currently enamored with. Maybe it is a bit ridiculous to think that these two brothers would fight it out in the ring. 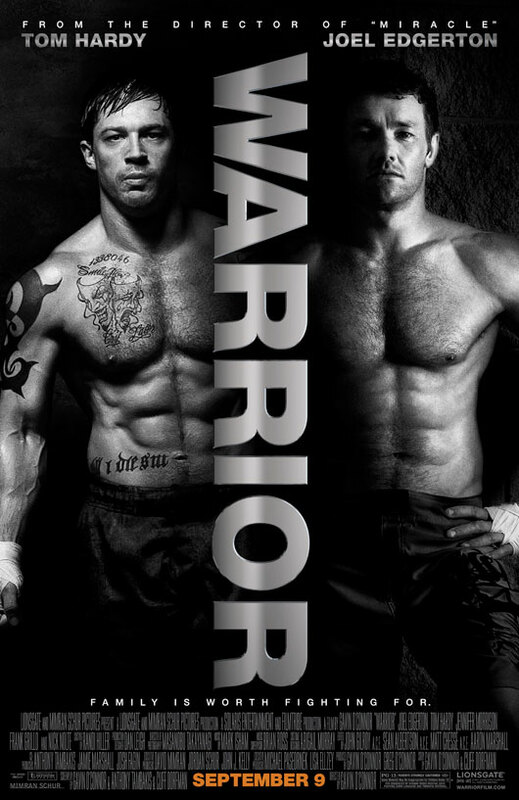 However, if you don't focus too much on that, Warrior is an entertaining main event.